I was in Tesco the other day. There, opposite the cookbooks, not so far from the grapes, hemmed in by sticker books, was the Minecraft Beginner’s Handbook. And it’s far too late to be surprised. Minecraft is a cross-medium phenomenon, like Harry Potter, Lord of the Rings or Lego. 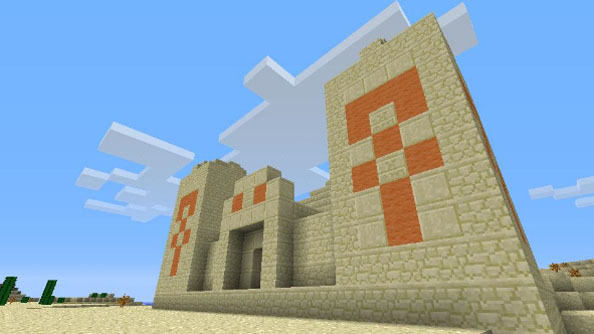 Those aren’t simply names pulled out of the pop cultural rift – they’ll be Minecraft’s stablemates if Mojang’s talks with Warner Bros yield fruit. Discussions sound like they’re in the early, tentative stages – though Hollywood sleuthbots Deadline are reporting that rights have already been handed over. Whatever the case, I can’t imagine Warner Bros will let this one go. Especially after The Lego Movie has clicked firmly into the top spot at the US box office for three weekends running – a practically unheard of feat. There seems no question it’ll be animated. The Lego Movie’s Roy Lee, who also worked on Dreamworks’ How to Train your Dragon, will produce – alongside Mean Girls’ Jill Messick. They’d do well to bring back the entire Lego team, Australian animation house Animal Logic and writer/directors Phil Lord and Chris Miller included. And against the odds, they captured the essence of Lego – the plastic bricks sold like model airplanes but better suited as imagination fodder. I think there are similar tensions at the heart of Minecraft – the survival game about colonisation and finding home; the unfettered creation tool; and the platform for authored adventures. A proper Minecraft movie would have to encompass at least one, if not all of those elements. What do you think a Minecraft movie should look like?